Today, I want to pause the general discussion orbiting the textual contest in John 1:18 in order to focus on the contents and character of the text in Codex Sinaiticus, one of the manuscripts that favor μονογενὴς θεός (without ὁ). 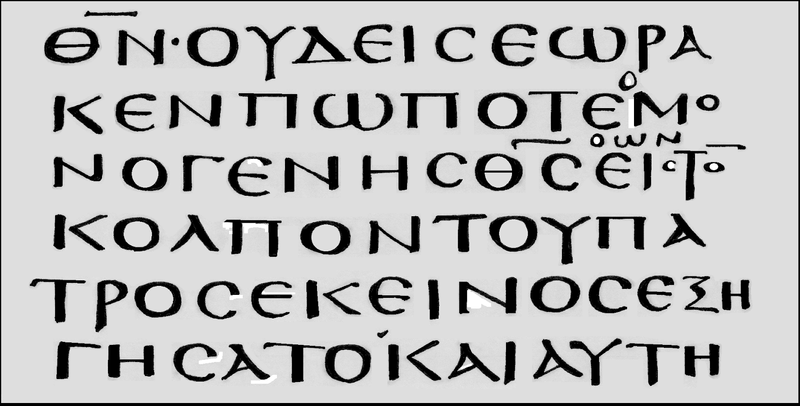 Although Sinaiticus is usually considered to be a flagship manuscript of the Alexandrian Text, in John 1:1-8:38, its text is not Alexandrian; it is Western. This was shown by Gordon Fee (in Codex Sinaiticus in the Gospel of John: A Contribution to Methodology in Establishing Textual Relationships, in New Testament Studies 15, 1968-69). This elicits a question: if ὁ μονογενὴς υἱός is the Western reading of John 1:18 – as Hort emphatically asserted – then why is something else (μονογενὴς θεός) found in Sinaiticus? (Here is the relevant quote from Hort: “It comes out with perfect clearness that υἱός is one of the numerous Ante-nicene readings of a ‘Western’ type (in the technical not the strictly geographical sense of the word).”) Finding θεός in John 1:18 in the Western portion of À is a bit like finding a lemon growing on an orange tree. Sinaiticus very often has no Greek allies in the first chapter of John. Why? Partly because Codex D is not extant for John 1:16-3:26, but there is more to it than that. I deduce that the text of John 1 in Sinaiticus is not merely Western; the copyist used a Western exemplar but freely drifted from its text. Although in theory this could occur almost anywhere in the text’s ancestry, it seems likely that this array of readings originated as À’s text of John 1:1-8:38 was transcribed. Sinaiticus’ copyist was obligated by a lacuna in his main exemplar to resort to a secondary exemplar, but he did not trust the secondary exemplar and felt free to take some liberties with its contents. What is the basis for this deduction? What would make a scribe reluctant to trust an exemplar, even a secondary one? Enter Heracleon. Heracleon was a Valentinian Gnostic writer in the second century, generally regarded as one who taught in Italy, possibly in the city of Rome. Bart Ehrman has presented some data that suggests a special relationship between the text of Sinaiticus in John 1:1-8:38 and the text used by Heracleon (see the essays Heracleon, Origen, and the Text of the Fourth Gospel and Heracleon and the ‘Western’ Textual Tradition, chapters 14 and 15 of Studies in the Textual Criticism of the New Testament, Vol. 33 of New Testament Tools & Studies, 2006). À* agrees with several readings in the text of Heracleon, as cited by Origen. One particularly impressive example involves the text of John 1:21: Heracleon claimed (according to Origen) that John had denied being a prophet (instead of denying that he was the prophet); this indicates that Heracleon’s text of John 1:21 lacked the article ὁ before προφήτης – and this is the extremely rare reading of À*. We see in John 1:21 in À* the same kind of unusual reading – the omission of an article – that we also see in 1:18. 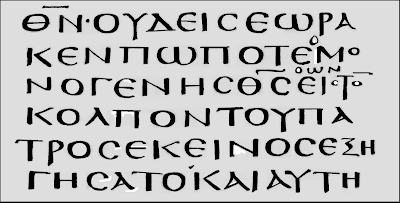 Another reading in À that corresponds to a reading which can plausibly be deduced to have been in the text used by Heracleon is the presence of εστιν (“is”) in John 1:4 instead of ην (“was”). Now take a close look at how Origen cites John 1:18 in his Commentary on John, Book Six, paragraph 2: as Origen contests Heracleon’s view that John 1:18 is a statement from John the author of the Gospel – Origen considered it a statement by John the Baptist – Origen cites the text with “only begotten God” without the article. A little later, Origen cites John 1:18 again, this time without any noun after “only begotten” – that is, as Origen cites most of 1:18 in two segments, the first segment is “No one has seen God at any time,” and the second segment is, “The only-begotten who is in the bosom of the Father.” You may recall from the previous post that this was probably the reading of the Diatessaron. In conclusion: a comparison between the text of Heracleon (as represented by Origen) to the text of John 1:1-8:38 in À indicates that Sinaiticus’ text of John 1:1-8:38 was influenced by an exemplar which frequently agreed with the text of Heracleon. If the scribe of À recognized that his secondary exemplar was a manuscript used by Heracleon, the scribe would very probably consider it right to harbor suspicions about its accuracy, and to filter its unusual readings via comparisons to the quotations embedded in Origen’s commentary. Who was in charge of the scriptorium in Caesarea in the mid-300s? Jerome informs us (in Lives of Illustrious Men and elsewhere) that at Caesarea in the mid-300’s, bishop Acacius, followed by bishop Euzoius – both of whom subscribed to Arianism – improved the library’s holdings by transferring to parchment various texts which were in danger of being damaged or lost, having been written on papyrus. Although Jerome does not explicitly state that Biblical texts on papyrus were among the materials that Acacius and Euzoius transferred onto parchment, it seems reasonable to think that Biblical texts would be prioritized in such a project. And if Acacius oversaw the production of Sinaiticus at Caesarea, this would account for (a) his access to the text of John used by Heracleon – reckoning that Origen must have taken a copy of Heracleon’s work to Caesarea, inasmuch as he cited it in his Commentary on John – and (b) his willingness to replace readings in his exemplar with readings that he could recollect or harvest from the writings of Origen, and (c) the generally Alexandrian character of the text of À in the rest of the Gospels, Acts, and Epistles, echoing Egyptian exemplars either taken to Caesarea by Origen in the 200s, or acquired later in the 200s. The implication of all this is that although John 1:1-8:38 is essentially Western, it also contains non-Western readings where the copyist abandoned his exemplar. The reading μονογενὴς θεός is one such non-Western reading. Rather than show that μονογενὴς θεός was ever a Western reading, À shows its scribe’s willingness to abandon his secondary exemplar – likely an exemplar associated with Heracleon. In conclusion, À’s reading μονογενὴς θεός, although found in the Western section of À, is unlikely to be representative of À’s Western exemplar, and is more likely a reading introduced by the scribe of À on the basis of his personal familiarity with the reading θεός after μονογενὴς as it is found in Origen’s Commentary on John. Readers are invited to check the data in this post, and to explore the embedded links to additional resources. I would like to see more of what you think about Skeat’s “complicated” theory. Your assumption that Acacius’ scribes were writing large characters on enormous quantities of expensive parchment for the giant format of Sinaiticus (and Vaticanus?) solely for the benefit of their one-eyed supervisor strikes me as unconvincing. According to Skeat, the giant format of both manuscripts was to please the extravagance of Emperor Constantine, who had the ambition and bountiful resources from the Imperial Treasury to produce 50 Bibles for churches in Constantinople. He commissioned Eusebius to undertake the project. It is also noteworthy that such a project envisioned the production of manuscripts including the Old and New Testaments plus the Apocrypha in a single codex, never seen before or since. The magnitude of such an undertaking can be understood from the fact that the Greeks never again attempted to produce a single-volume Bible in the next 1100 years of manuscript making. Thus the Vaticanus and the Sinaiticus are unique in the history of manuscripts. I do not think the honor of making such manuscripts should go to an obscure supervisor in the Ceasarea scriptorium. It wasn't just for Acacius' benefit; it was part of a larger project to preserve the texts at Caesarea that were written on papyrus. The papyrus was decaying, so everything had to be transferred to parchment. But if you look at the dimensions provided by Skeat, it's clear that Vaticanus, while thicker, is not remarkably taller or wider than a typical MS. Sinaiticus is enormous in comparison. Skeat proposed that the format of Aleph was Eusebius' Plan A but that he abandoned such a large size because he realized it would be a drain on resources and time. However, any experienced scribe or diorthotes would come to that realization within moments or minutes of considering it; nobody would make a complete Bible and then think, "It would take a lot of time and resources to make another 50 of these." The scale of the project would be obvious before one was done ruling the parchment. Well there is also Codex A to consider. And there's a tradition that Lucian of Antioch wrote a complete New Testament in his own hand (in three columns per page, like Vaticanus!). But to say that the codices that Eusebius produced were "never seen before or since" is to answer the question being asked. It would be entirely within the means of Acacius to preserve texts of Scripture at Caesarea adapting a format similar to one his predecessor (Eusebius) had used -- attempting, in the process, to add Eusebius' Canon-numbers to the Gospels, but the scribe who added them did not have a strong grasp of their purpose. That doesn't seem like a strong argument; first, Acacius was not obscure in his own time. Second, we know (because Jerome tells us) that Acacius and Euzoius made manuscripts to replace the papyrus copies in the library at Caesarea that were wearing out. The only question is whether Sinaiticus was among those MSS. I think there is a very strong likelihood that it was. But before proceeding further: do you have Skeat's articles on this on hand? They can be found in his "Collected Essays." You are right to include the Codex Alexandrinus as a complete Bible. My mistake. I have Skeat’s book and you can refer to whatever page in the book you need in order to continue this discussion. Skeat says that Siniaticus was on the verge of completion but was never completed. You mention that the scribes did not add Eusebius' Canon-numbers to the Gospels because they did not grasp their meaning. I find it hard to believe that experienced scribes who had the leisure and expertise to write millions of characters in neatly defined columns, collate pages into quires, and paginate them accordingly (a very tedious and complicated task!) could make such a simple blunder when it was almost done. If they had an Eusebian exemplar to work with, there should have been no problem in adding the Eusebian canon numbers. The lack of canon numbers seems to support Skeat’s idea that the manuscript was abandoned on the verge of completion, in order to go with the more economical Vaticanus. They might also have recognized that the Sinaiticus, upon proofreading, was flawed with so many errors that it would be unacceptable as an official Bible. How do you explain the Siniaticus, from the point of view that Acacius did it, was flawed with so many errors? You cite a tradition that Lucian of Antioch wrote a complete New Testament in his own hand. Of course this would be an unprecedented achievement for the time. The Siniaticus and Vaticanus were far more ambitious undertakings with Old and New Testaments plus the Apocrypha. According to Skeat, the Siniaticus was a prototype. Even with experienced scribes, it would be hard to conceive of what exactly is involved in regard to resources and time, when undertaking a never-before-seen complete Bible. It was only in the final stages of making Siniaticus, that they realized the enormous magnitude of the manuscript and became daunted by the idea that they had to make 49 more. Since you disagree with Skeat that they were Constantine bibles, what are your thoughts on the timeline of the making of the two codices. Which came first, Siniaticus or Vaticanus? Furthermore, do you think that Acacius had a Constantine Bible as exemplar to work from? Or did the Constantine Bibles never became reality?